The area between Virginia’s Sky Meadows State Park and West Virginia’s Harper’s Ferry boasts a section of the Appalachian Trail (AT) billed as the “Roller Coaster,” one of the AT’s toughest, up-and-down grinds. This 5-mile out-and-back to Raven Rocks covers a piece of the Roller Coaster, a hilly affair that ends at a scenic vista overlooking the Blue Ridge Mountains and the Shenandoah Valley to the west. It also straddles the border between Virginia and West Virginia, starting outside Bluemont, VA and ending in the Mountaineer State. 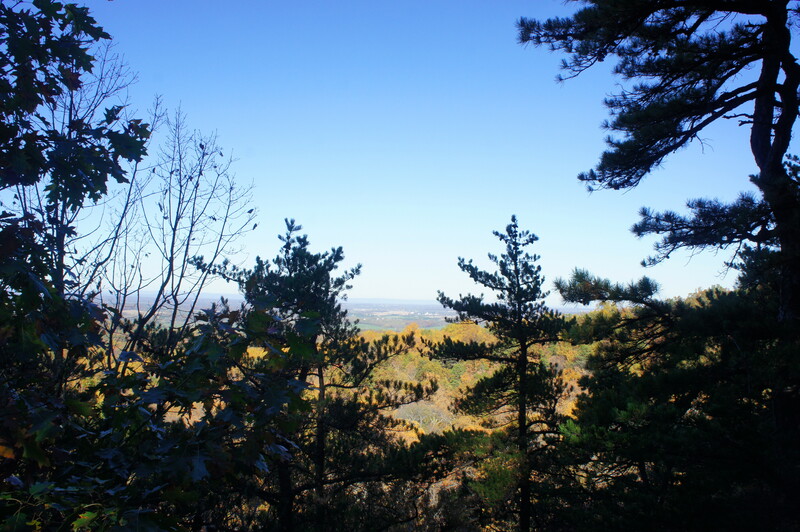 From the small parking lot off Pine Grove Road, climb a set of steps to begin the hike, then follow the gradually-sloping Appalachian Trail (AT) as it heads northbound. The trail here skirts the wooded western slopes of Blue Ridge, a lengthy crest of upturned quartzite extending from southern Pennsylvania to central Virginia. 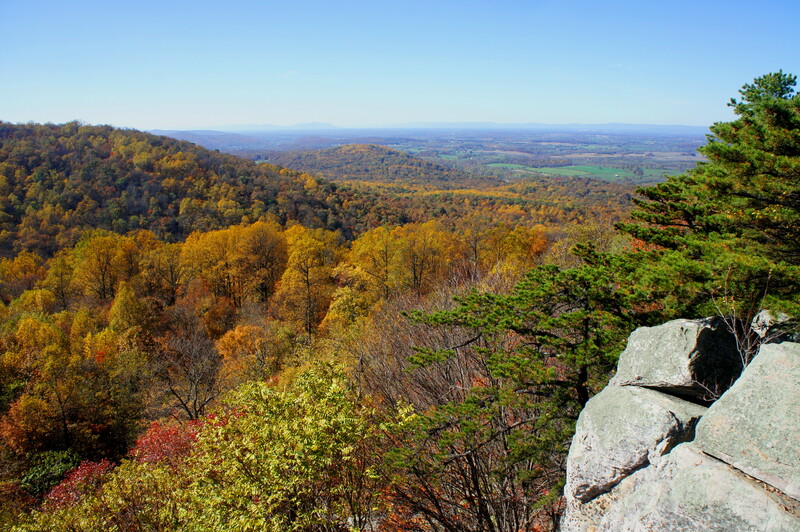 Stony outcrops are ubiquitous throughout the hike; one such jumble offers an obscured view of Shenandoah Valley at the ¼-mile mark. After cresting a high point at around 1/3 mile, the AT drops down a sharp switchback and then rounds another outcrop with a window view to the northeast, framed by a stand of hemlocks. Now about ½ mile from the trailhead, the rocky track descends another set of switchbacks then makes a final plunge into Pigeon Hollow, formed by a seasonal stream often devoid of water. Having completed the first up-and-down, the trail repeats the process as it begins to climb out of Pigeon Hollow and meets an unmarked junction at 7/10 mile; stay left on the blazed path. The trail levels off for a short period around the one-mile mark, then picks up again minutes later. 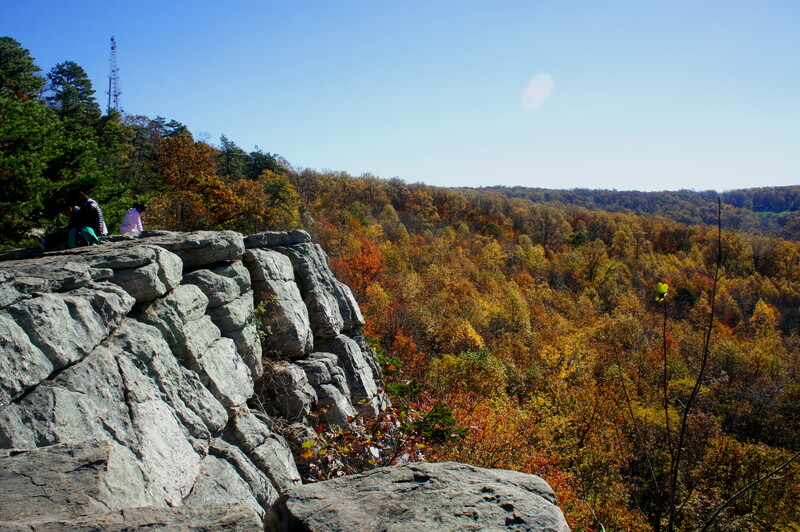 The hike’s high point (1,225’) is reached at around 1.6 miles, where several rock outcrops offer partial vistas. What goes up must come down, and the Roller Coaster continues by dropping steeply into the next ravine, Raven Rocks Hollow. This valley is wider, and the streambed at the two-mile mark is more pronounced, requiring some rock-hopping to clear. 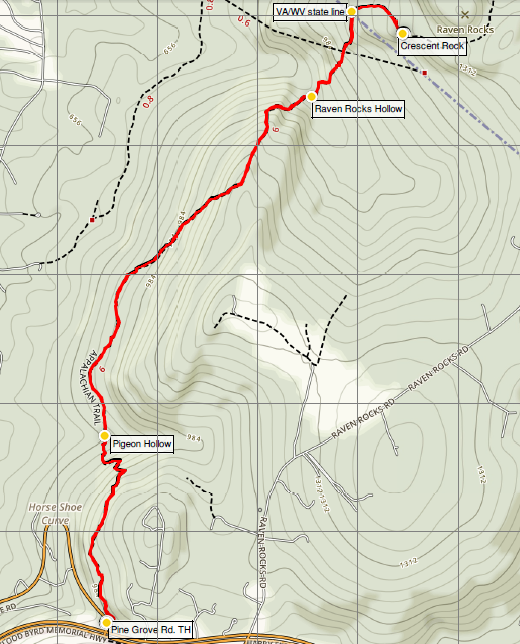 A short spur trail heads left to a natural spring, while the main path continues northward. 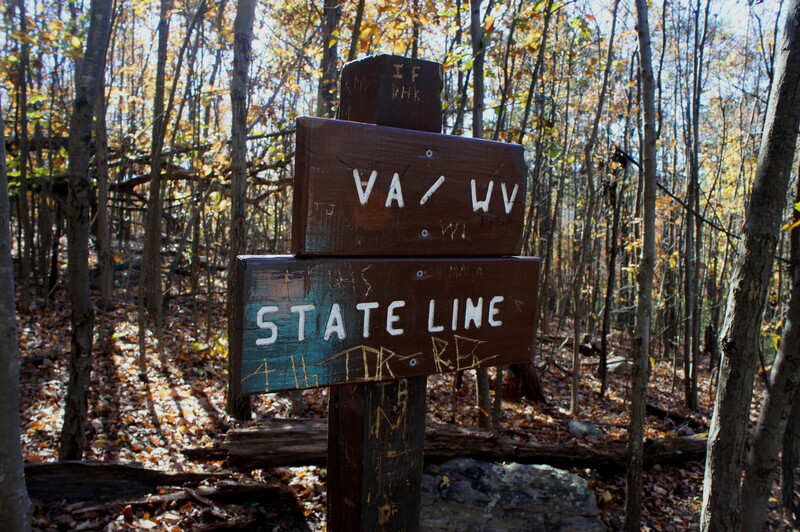 Climbing sharply again, hikers enter the final leg and pass the Virginia-West Virginia state line at Mile 2.3. Now in the Mountaineer State, the trail bears east across relatively level terrain to the brink of the quartzite cliffs. 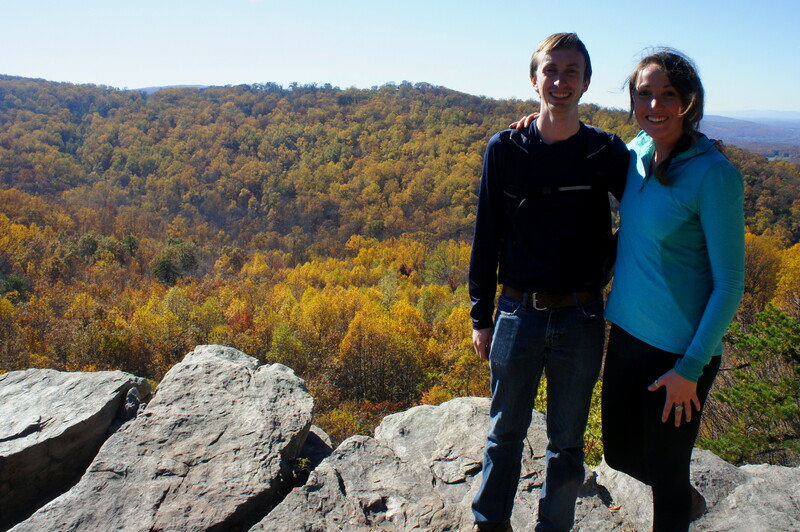 About 2.5 miles from the trailhead, hikers emerge from the woods at Crescent Rock—part of the collective “Raven Rocks”—a magnificent overlook perched high above Raven Rocks Hollow. 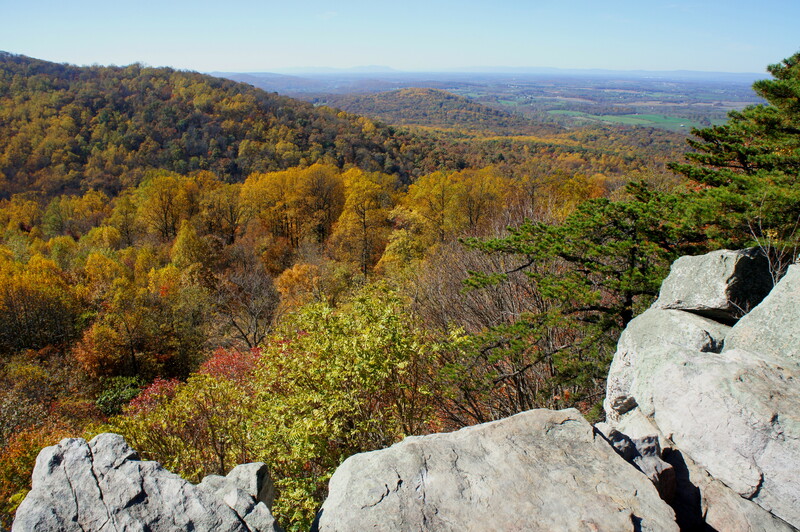 The highlight is the view to the southwest, where the Shenandoah Valley unfolds and reveals a patchwork of woods and cultivated fields. 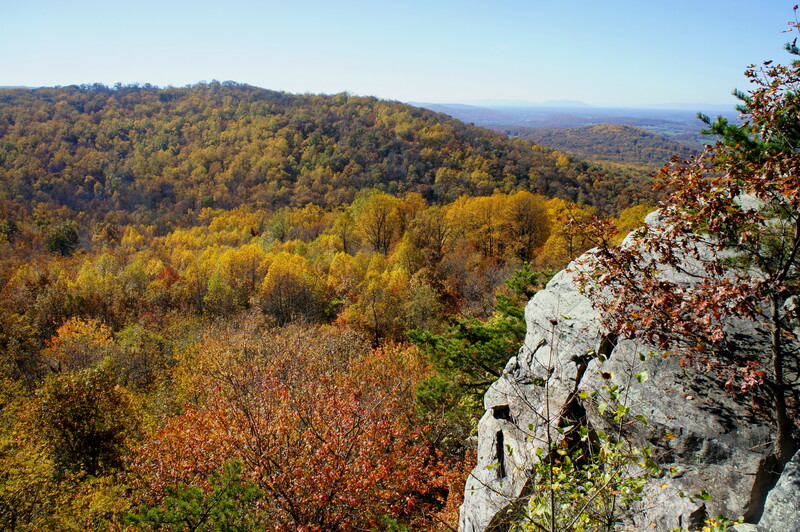 On a clear day, Massanutten Mountain, which ends abruptly at Signal Knob (2,106’), is visible across the valley to the southwest. Popular with rock climbers, the vertical cliffs at Crescent Rock drop more than 50 feet, making for nice photos and adding allure to this ideal lunch spot. It is possible to continue north from here on the AT to the Devil’s Racecourse, Blackburn Trail Center, and beyond, but this is probably best left for an overnight backpack. Instead, turn back the way you came, reversing the dips and climbs back to Snickers Gap. Though rarely staying level, the climbs on this hike are generally less than 400 feet and relatively gradual, though hot weather or weary knees could make this hike a lot tougher—hence the “moderate to strenuous” rating. I would suggest allotting at least four hours for the round-trip to and from Crescent Rock, including a lunch break. This entry was posted in Moderate Hikes, Virginia, West Virginia and tagged Appalachian Trail, Blue Ridge, Crescent Rock, Pigeon Hollow, Raven Rocks, Raven Rocks Hollow, roller coaster, Snickers Gap, Virginia, West Virginia. Bookmark the permalink.